Bring out your inner chef and design your own customised apron. Personalised photo aprons are fun gifts for budding chefs, keen gardeners, and playful kids who want to get messy without the clean up. Our water resistant photo aprons come in three sizes for men, women, and kids, so what are you waiting for? Ready, steady, cook up a custom apron! Tired of washing up and looking like you’ve been in a downpour? Maybe you want to encourage your kids to bake but worried about ruining their clothes, or are keen to get in the garden but not get muddy. Our personalised aprons with photos are the stylish and fun way to make a mess. What’s better is that they’re made from our faux suede fabric which is water resistant and fire retardant, making your personalised aprons completely safe. I ordered an apron with photos on it. The photos are really clear and the quality of the apron was much better than expected. My order arrived within a week from overseas. I’m very impressed. Very quick delivery and super simple design tools for the product. I could not believe how quick this order came from overseas to Australia. It was so easy to design what I wanted. Thank you. Bought my mum an apron and it’s fantastic! Bert happy with the product and very happy with the customer service! Quality of the material appears to be high standard and the images are printed very clearly. I also thought the website was very user friendly. Care: Pre-washed, pre-shrunk and fully washable in normal colour washes at 30°c. No abrasion – the print won’t rub off. Like many of our products, the personalised aprons come with a quantity discount, so buy more than 1 today to save money and save making a mess! Your photo aprons are all handmade to order. Digitally printed onto the faux Suede Vision fabric, your photos or designs are reproduced with impressive detail, vibrant colours, and permanent print which will not fade. Your printed fabric is then cut to shape by our textile professionals. An apron tie in your chosen colour (beige, mushroom, or black) is hand stitched to the apron to complete your unique gift. The faux Suede Vision fabric is soft to touch and doesn’t fray, making it ideal to use around food. We print your photos or design onto the entire face of the photo apron so you’ve got a lot of space to play around with. White stitching runs around the edges so you can see the love and care that’s gone into its creation. Personalised aprons make the best novelty gift for women and men. Go down the saucy ‘naked chef’ route with your design and turn the heat up in the kitchen! For the guys who love to man the BBQ, give him a customised apron with his own title, such as ‘Big Daddy’s BBQ’ or ‘Warning: Hot Stuff’. Personalised women's aprons with their favourite photos are also great as stocking fillers for ladies who love baking as much as Mary Berry. Make an apron with text so everyone knows she is the 'Bake Off Queen'. Recruit your next baking assistant with personalised children's aprons. Featuring their own name and photo, custom kids' aprons are the perfect way to get the little ones involved in the kitchen and learning about food. Or use the kids' personalised apron for painting to protect their clothes. A wonderful idea to boost their creative confidence is to print their customised apron with their very own artwork to make a totally unique birthday present or treat for doing well at school. Personalised women's aprons for are perfect for grandmas who can’t stay away from the garden. As a photo apron gift, personalise their pinny with a photo collage of all the family. Choose their favourite colour for the background, select your pictures and watch your personalised apron come to life. Personalised aprons are a unique way to promote your business. Whether you're in kitchenware or food sales, or large scale events catering, a custom printed apron will let your customers know your name and purpose in an innovative way. If you run a cafe or bakery, you could kit out the whole team in personalised business aprons as a great way to show company cohesion and look even more professional. Add your company name, your logo, and even the titles and names for each member of staff, so you customers feel that truly bespoke touch when receiving your service. 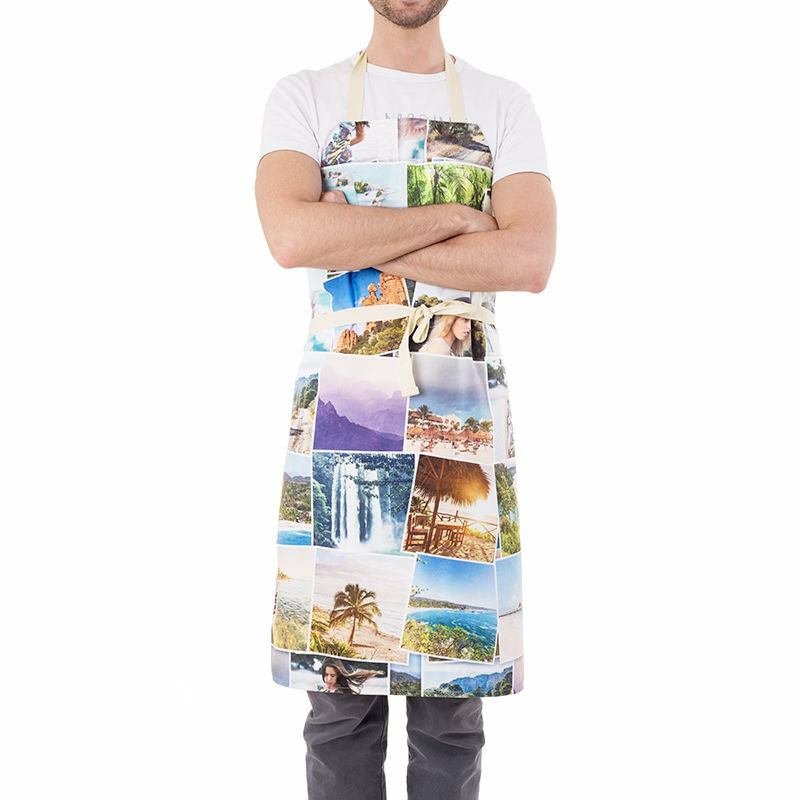 Portrait photos work best on personalised aprons, but if you have a landscape image you really want to use, we suggest tiling it to get the best print quality and finish. Roughly 1cm is folded around the border for sewing, so keep all details away from the edges to avoid disappointment.